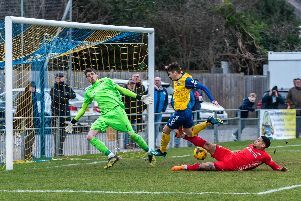 Louis Bell is back at Gosport Borough to help them in their fight to avoid relegation from the Southern League premier division south. Bell played an influential part in keeping Borough up last season and now he is hoping history will repeat itself. Manager Craig McAllister and his assistant Matt Tubbs are still playing so it is useful to have another presence on the bench and in the changing room. Bell is happy to be back making his contribution. 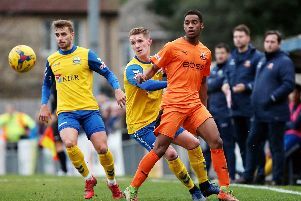 He said: ‘I went over to Borough last February after leaving Baffins Milton Rovers. ‘To be honest I probably left Baffins before I was pushed. ‘There were one or two things happening over there that I wasn't happy about. ‘I first went to Borough to work alongside Alex Pike but when he was sacked McAllister came in. ‘We struck up a good working relationship to try to keep Borough up. During the summer Borough appointed ex-Weston-super-Mare coach Ryan Northmore as manager. That failed to materialise when Northmore’s Colombian born wife failed to get a visa to come into Britain. Northmore resigned and chairman Iain McInnes once again turned to McAllister. Bell was out of action after being hospitalised for surgery. When fully recovered Bell got the call to return to Privett Park to help them once again avoid the drop. He added: ‘I had no hesitation in going back. ‘When you look at how much the chairman puts into it he deserves to be successful. ‘He is what I call a true football man. ‘The club cannot afford to go down and we will do our utmost to keep them up. ‘We have the quality of players to achieve it again. ‘Now it is all down to having the passion to get ourselves out of trouble. ‘It is going to be a battle and having the mentality to win football matches is the key. ‘Staying up is the be-all and end-all.